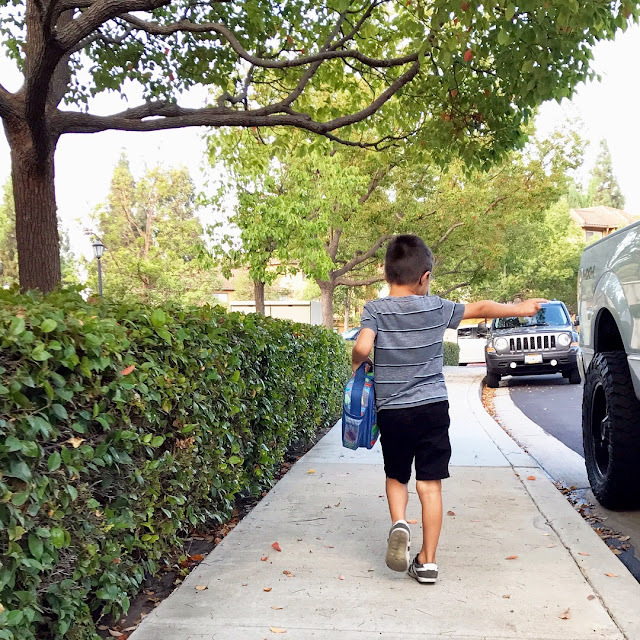 When I last left you, I left you with the uncertainty of if Mason would remain in the kindergarten/1st grade combo class or if he would be moved to a kindergarten only class and I'm happy to say that he got moved! 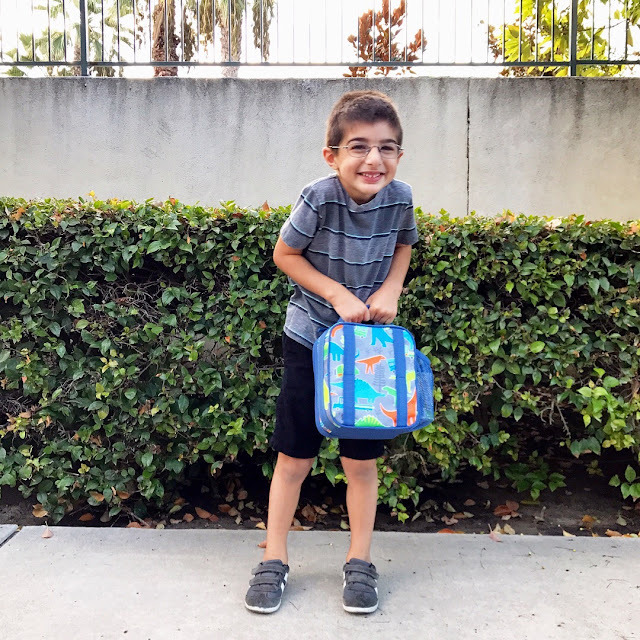 Tuesday, September 5th was Mason's first day in his new class. We prepped him all weekend and explained to him that he'd be going in to a new class come Tuesday and while I think he is still a bit confused (when we ask him who his teacher is, he sometimes still says his old teacher's name), I think he is also excited because a couple of the kids from his after school care are also in that class. Day 1 and Day 2 at his new class went well! 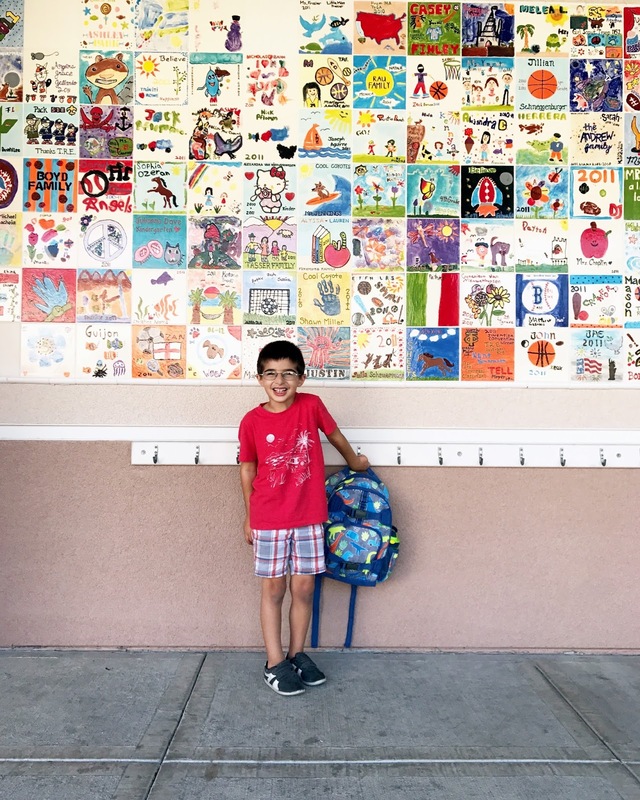 He was super excited to finally be able to hang his backpack outside the classroom on the hooks that we see all the other kids hanging their backpacks on (he used to have to take his in with him and hang them on the other side outside his classroom in the 1st grade wing). He stood in line by himself, with his new classmates, and then teacher came out to walk the kids in to the classroom. I was standing off to the side and he said "bye mommy!" and walked right in like a pro. I stopped to just introduce myself and say hi and point Mason out to her before she went back inside and saw him sitting there with his classmates on the rug waiting for the teacher to come back. All in all, I think this was the right move and the best move for him. We are very happy about it and can't wait to see how the rest of the school year goes in his new class. Without getting in to too much detail, the IEP meeting on Friday went WELL. Or in my opinion, it went well. It started out with the principal saying that they thought Mason would do well in the combo class due to his scores on his evaluation last Fall, but due to the fact that table work is not his strong suit and he needs a little extra help and re-direction, they wanted to move him to a kindergarten only class. We fully agreed. I mentioned that I'd like to get him evaluated for OT (occupational therapy) to help with some fine motor skills delays and they fully agreed. His now 'old teacher' brought in some writing samples and I had his evaluation from his old OT place for reference so they had a good starting point to base the evaluation on. His now 'old teacher' also mentioned a couple behavioral things that he was doing in class that she wanted noted. During circle time she mentioned that she will ask a question and Mason is always very quick to answer. She said he is very smart and always knows the right answer, but he blurts out the answer, loudly, and doesn't let other kids have a chance to answer. She doesn't want to crush his spirit and his love for learning, but she also needs to let the other kids have a chance to answer also. And then she mentioned something that we'd never experienced before... he's been taking off some clothes in class. Apparently he is either VERY comfortable in her classroom or is seeking some sort of sensory stimulation and takes off his shoes, sometimes socks, and lifts up his shirt. With a simple "Mason, we need to keep all our clothes on in class", he seems to be able to put his shoes back on and be fine with it, but she wanted to have it noted. In addition to that, apparently he got completely undressed at his after school care the other day when he thought he needed to change his clothes because he was wet (an accident or some sort of water spilling). They appreciated the effort, but right next to his cubby is not the best place to change... the bathroom is. One other kid noticed what was going on and alerted the teacher who helped Mason change in an appropriate location. I, personally, think it's just because everything is so new to him. I'm sure it is very overwhelming and over stimulating for him to be in all these new environments, so considering, I think he's doing great. I repeated to him over and over about the appropriate place to get changed and to let his teachers know, so hopefully as time goes on, things settle down and he starts to know more what to do. I also mentioned that he used to have an ABA therapist with him a couple days week in preschool, but otherwise he was mostly alone. However, there were three teachers there vs just one and a lot less kids, so who knows how much they were re-directing him then. This new class will have an aid, not specifically for Mason, but for some of the other kids, so while they can't focus their attention on him, they can help. The IEP team is also going to be looking in to a behavioral assessment of sorts to see how he is in the classroom and if he needs extra help specific to him. Again, all things considered, I think Mason has done AMAZING with the transition to kindergarten. There are all new kids, all new teachers, all new school, all new rules, everything is... all new. He didn't cry when he dropped him off on Day 1 (VERY different than Day 1 of preschool or even Month 1 of preschool) and he just exudes this confidence, excitement, and happiness. Starting a new school where you know nobody is overwhelming and scary for even me to think about but he has taken it in stride. I probably won't update all that often unless something else happens (I'm sure you don't need a week to week play by play 😉), but we have parent/teacher conferences in October and then his annual IEP meeting in November as well as a 60 day update IEP meeting in November so more updates will probably come then. It sounds like he's doing well! Glad to hear it's going smoothly! Mason continues to amaze me! I'm so glad to hear he is doing so well, and happy he was moved into the K only class! I'm so happy that he is doing so well! Yay, they put my son in a 1/2 combo class and I'm not sure how I feel about that, we'll see, so far so good. He is just going to do better and better as he learns the rules. Yay Mason! I love that you are sharing this because as a Momma who is sending her child to K next year, I'm so anxious. It's so welcoming to hear that you have school personal that is willing and able to work with you and not against you! So glad he got moved and that it is going well! That's a relief that he was moved to a kindergarten only class! Kudos to Mason for doing so well with all the changes! You deserve a glass of wine though too :) I'm sure all this evaluating and switching and talking to teachers is a little stressful, so hopefully some of that will ease up. Your school and teachers sound like they're doing an amazing job, and doing everything possible to give Mason the best tools possible. 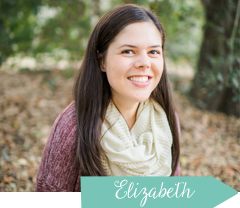 You totally made the right choice in schools, Liz. 33 Things About Me On My 33rd Birthday!